Farm in the dramatic play or pretend play center is a TON of fun for students! As you know, I LOVE the pretend center and having students play a big part of setting it up for play. The kids (and I) are having a blast and learning a ton. If you want to do it in your classroom, head over to my TPT store and check out Farm Dramatic Play. The dramatic play center provides so many learning opportunities across ALL learning domains. To help parents understand that kids are not just “playing”, I sent home a parent letter introducing the new farm theme highlighting specific skills students will be developing during their play. To begin the new farm theme, I put out tons of non-fiction books about farm. We create an Idea Chart/Web. It is their job to research in the books what farm animals, supplies, places, people, and food is on a farm. I use post-it notes so hey will stick the chart. It also shows me students’ prior knowledge and any misconceptions they may have. By spring, students know exactly what to do to create the web! They got busy right away. I even had a few students who wanted to keep working on the web during our Friday dance party! You know they are excited about a new theme when they pass up a dance party! I put in my plans the Friday before we start a new them to create the idea web. It gets the students excited for the next theme. Students can help me take down the last dramatic play center so when we come on Monday is it ready for us to start creating! Here is what I did to create the center and what it looked like when they came in Monday. Here is what students did to create the center. They had it ready to play by Wednesday. On Monday and Tuesday during center time instead of playing, students painted murals and made other parts of the farm if they choose to go to the pretend center. I showed students the signs/pictures of what they were going to paint and together we noticed the characteristics of each plant BEFORE they painted. Students only painted the stems and the leaves o the plants. In the art center and for a table time activity Tuesday morning, students made the fruits and veggies for our farm! It was a fun way to get some cutting practice in. I stapled the Velcro to the wall (plants) and stuck the other side of the Velcro to the fruits and veggies. Now students can harvest the fruits and veggies during play! Look at finished murals! I LOVE that students made them and not me. For one thing, I am not an artist and yes it would have been faster if I did it (and cleaner). Most importantly, the students took charge, painted the murals, and now their art is in the center! They know that I value their work and isn’t it amazing! Don’t be afraid for it not to look perfect. Two of my three year old boys painted the orchard and it turned out awesome! Oh I almost forgot, during table time, I had one table paint flowers for the garden. Hay! A farm has a lot of hay. I have some friends who needed more practice cutting long lines so this was the perfect activity for them. I coped the “hay” (lined paper) on yellow paper and students cut on the long lines to make the hay. They glued it to brown paper for the cows and sheep in the barn, glued it to cracker boxes to make the hay bales, and glued it to the bottom of the chicken house. Once your students get used to making most of what you need in the center, they will start coming up with what they need for play, how to make it,and what supplies they will need to complete the project. This was the first theme this year, I just gave them the materials and let them do it. I was the neatest experience. I had a student already tell me he wanted to make a pond, ducks, and fish next! Farm Animals….I did not have big farm animals for the farm. The kids made them! I made the patterns, students cut them out, and decorated them. Do you see the cow with all four legs at the bottom and the head at the top like a person? LOVE it! My three year old friend made that. Super cute! Look at their cute chickens and chicks in the chicken house. The nests are just paper bags folded down. The eggs we made with Model Magic that I pulled out from the Bakery theme we did in December. The farmer can collect the eggs during play! The cows and sheep are the barn. A kiddo fed them hay bales. The pig pen. A kiddo told me he needed brown tissue paper to make the mud. He crumbled it up into balls and glued it to a brown piece of paper. If you are wondering how the animals are standing, I will share my trick with you. I taped blocks to the back of each animal. Writing! I have the my pre-k kids sound out the words for the signs. It was an arrival activity Monday morning. They also sounded out the words for the shelf labels. My three and four year old friends made dirt for their arrival activity the same morning. They cut strips of brown butcher paper and crumbled it up. My class opens at 7 am and kids trickle in. I always have an arrival activity on the table they have to do before they go play in centers. The use the “dirt” to cover their “seeds” (rocks) when they are planting seeds in the vegetable garden. They can also plow the field with the tractor and water the seeds. The tractor we made by painting a box and cutting a hole in the top of it. The hose is just a piece of a real hose from my house that was broken. Do you see the carrots and potatoes they hid in the dirt? Later they pretended to pull them out of the ground! Farmers can also water the garden and pick the flowers. There is a vase in the farm house to keep the cut flowers. The flowers have Velcro and a green pipe cleaner taped to the back for the stem. To add a writing component, farmers can write and draw To Do Lists before they go out in the field. To support students dramatic play, I created a role chart. It has picture icons for the things the farmer can do. This is VERY helpful to some of my kids who don’t know what to do in the dramatic play center. The picture icons are stuck with Velcro so students can remove them if they want too. For kids who like or need a visual schedule, I made a visual schedule of a farmers day. During small group Wednesday, we created a chart of all the things a farmer does on a farm to support their pretend play. Each student wrote the first letter of the idea they shared. Well that was a LONG post! There was just so much I wanted to share with you about our Farm. e will do doing farm for three more weeks so stay tuned to see what I add to keep them interested for three more weeks. Remember this for later! PIN THIS IMAGE! If you would like to do a FARM theme in your dramatic play or pretend play center, click HERE to purchase Farm Dramatic Play from my TPT store. It is 109 pages of tips, tricks, detailed directions, more real classroom photographs, and printables for you create a farm in your classroom. or get the Dramatic Play Bundle! Take the FARM theme all over your classroom! 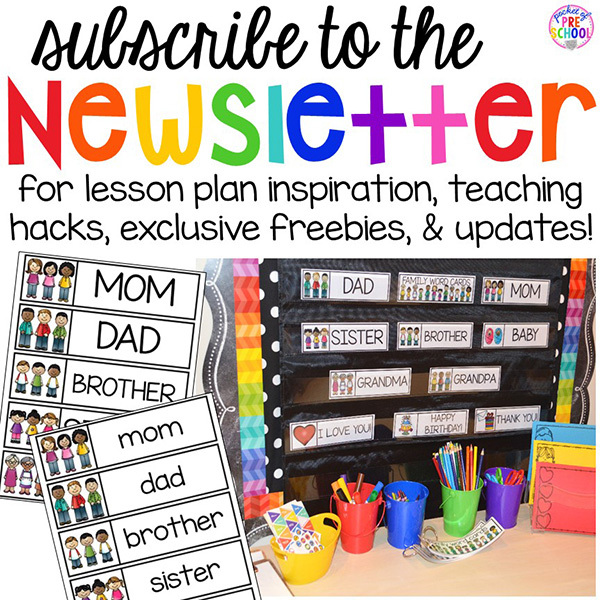 Go check out Farm Math and Literacy Centers and grab some FREEBIES while you are there too! Need more farm inspiration? Read all about my Farm Themed Art and Sensory Activities I did in my classroom.